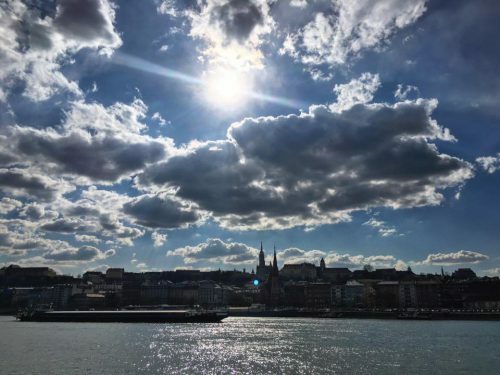 View over the Danube river in Budapest (Credit: Tanya Sharma). The train is quiet save the steady rumble of any old-fashioned locomotive. The noise laps gently at my ears, rising and falling with the heave of pistons. Night has laid its thick blanket over the window, replacing cityscape and countryside with the eerily distorted reflection of compartment’s innards. Bursts of unsuccessfully stifled laughter from two compartments over, where the rest of the BCBers are seated, are met by our own smiles of sleepy excitement. I look up from my scribbling to Alona (BA 2019). She is curled like a contented cat in the seat across my own. The words that have been running, screaming through both our minds for the past 4 hours or so have finally settled into a rumbling hum. We exchange a grin. I see the same words that have been at the tips of our tongues for so many weeks now hanging on the edges of her smile: “We’re going to Budapest”, she says. 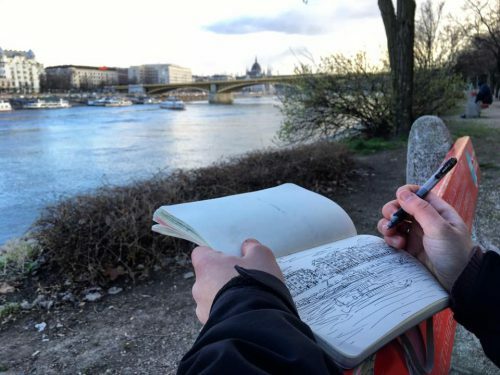 Artist Nancy Stanley sketches a rendition of the Margaret Bridge as Budapest soaks in the late afternoon sunshine (Credit: Tanya Sharma). Lately, I’ve been fascinated with the concept of in-between places. Take a bridge, for example, or a windowsill; hallways, doorways, sidewalks, metro-stops, Margaret Island, train compartments, to name but a few. I like to sit in these places to do nothing strictly useful. There’s something special about them. It’s got to do with how they are neither here nor there yet exist everywhere; somehow integral to both the spaces that they border but essential to neither. One wonders what they’re meant for. They make for good thinking spots. I wonder, sometimes, if Berlin would make this list. Was that the Danube we passed by this morning? It was a glistening monster of a river, all rippling scales and unknowable depth. Zoltan described to me again today how the Danube bisects the city: to the West lies Buda, to the East is Pest. Seeing the city for myself, I now finally understand what he meant. We are on the Pest side, in the apartment we will be sharing for the coming week. After almost half a day of marvelling only at sights that appeared along train tracks, it feels unnatural to stop somewhere so seemingly familiar. We float about the apartment as Zoltan, who we have unanimously decided will be our apu (father) for the trip, carries out the transaction in a language I can only describe as a conflation of Italian and some robust, Slavic dialect. 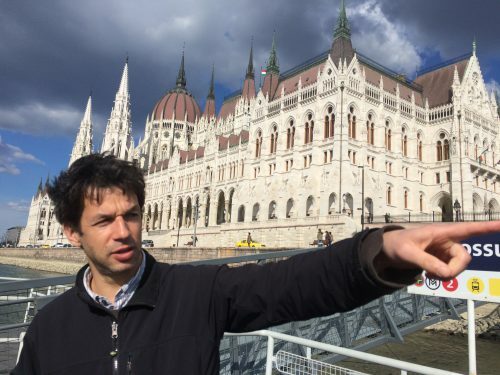 Zoltan set against the imposing Parliament building, pointing to a tug-boat travelling at record-slow speed along the Danube while we await the ferry that is to take us to Margaret Island. (Credit: Nancy Stanley). The giddy excitement that colored yesterday’s mood has only faded slightly in light of our sleepiness. We’re anxious to leave our luggage at the apartment and head into the city to refuel for our first day of exploration. 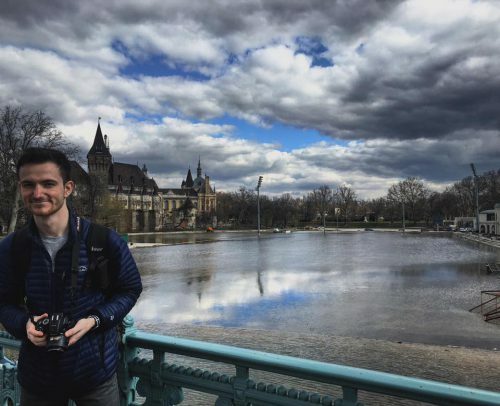 On the itinerary for today is a walk up to the Buda castle then back down across the Chain Bridge to Pest, with food, monuments, and the opportunity to ask all we’d like to satisfy our curiosity along the way. 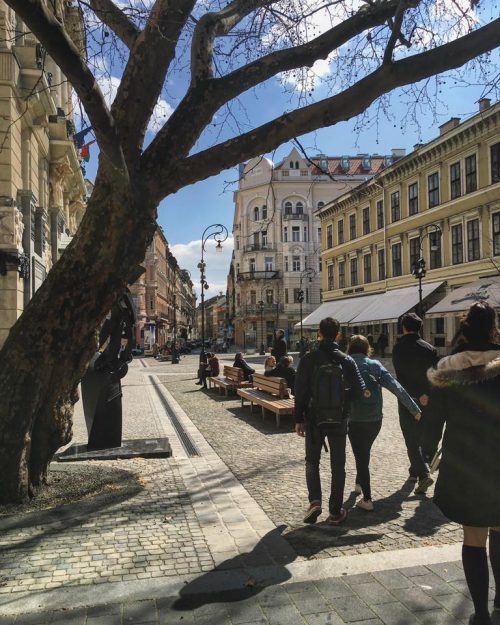 Alona, Ford (BA 2019), and apu Zoltan lead the way down the wide, cobbled streets as we take on the city on a sunny Tuesday morning (Credit: Tanya Sharma). The morning wind is brisk but the cloud cover looks flimsy enough that it might still be whisked away come noontime. 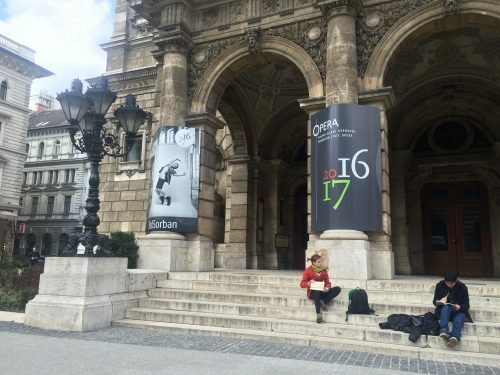 We sit on the steps at the main entrance of the Hungarian State Opera House, Magyar Állami Operaház, waiting to meet with apu Zoltan and Bisera. They will guide us through our second day in Budapest. The opera house is magnificent. The giant structure towers over us, the fragile intricacy of its stone facade at odds with the firmness of the material in which it has been immortalised. Its architecture speaks to a rich cultural heritage I have only begun to acquaint myself with recently in my Core courses at BCB. Andy and I sit on the stone steps of the Magyar Állami Operaház (Credit: Nancy Stanley). We take a look inside. We aren’t the only ones come to marvel at its timeless beauty: the entrance hall hosts about 15 others shuffling slowly past one another, some with cameras in hand and mouths agape. The effusive glow of the pink marble columns entices me. I caress the polished surface of the nearest one. The stone is cool and firm beneath my fingertips. Zoltan has arrived. He tells us the opera house was built in the late 1800s in the neo-Renaissance style. The paintings that wink down at us from the domed ceilings are “frescoes”, he says — an Italian word referring to the manner in which paint is applied to freshly laid plaster before it sets. (It can be contrasted with the lesser-known secco — or “dry” — plaster painting technique). The frescoes are alive; baby cupids dance through cotton clouds. I am captivated. The entrance hall casts a spell like music over the unsuspecting observer. I feel as if I have stepped into one of the Mozart concertos my parents used to play around the house as I was growing up. We leave reluctantly. The group looks chirpier this morning than upon our arrival. We are rested, breakfasted, and somewhat more ready for the unexpected than yesterday. Most of us had returned to the apartment before nightfall, slightly disoriented by the pace at which we had taken on the city. I fondly recall sprinting to catch the bus, missing said bus, frequent jaywalking, laughingly sharing some sort of traditional deep-fried potato delicacy reminiscent of an oversized pancake, and wandering for hours along the many winding paths atop Castle Hill. The plan for today looks almost tame in comparison. 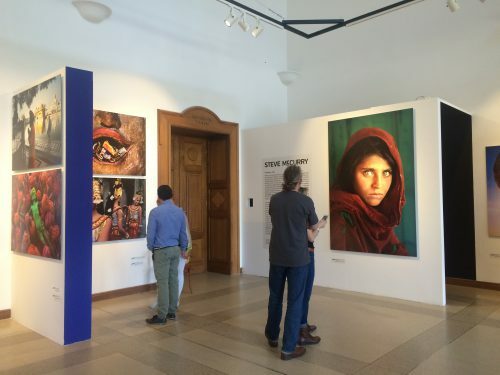 We are headed to the Műcsarnok, Budapest’s Hall of Art, for an exhibition of a selection of Steve McCurry’s photographs. Later, some of us who booked tickets in advance will visit the Müpa Budapest — the Palace of Art — for a piano recital given by renowned Hungarian pianist Dezső Ránki . 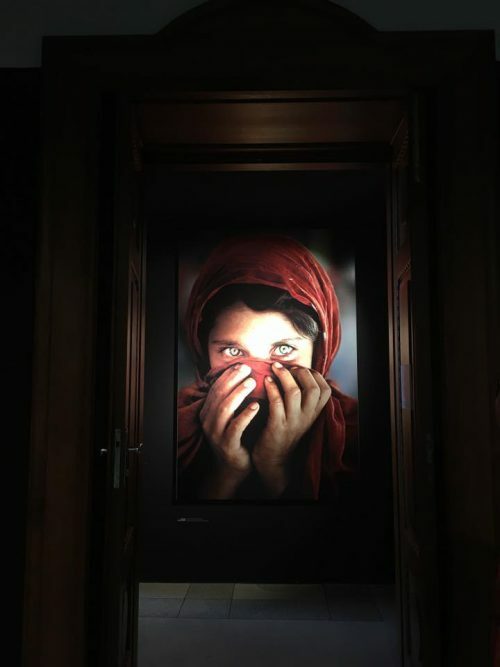 Steve McCurry’s portrait of an “Afghan Girl” from 1984 greets us at the entrance of the exhibit (Credit: Tanya Sharma). The photographer’s name does not strike me as familiar, but the picture on the brochure has haunted me since I can remember. It is of a caramel skinned, dark-haired girl in a currant-coloured scarf. She holds the tattered cloth over her mouth. Her eyes tell of such fear and suffering as I hope never to understand. I imagine they are screaming. I can almost touch the colours of the photographs. Against the sterile whiteness of the wall, the photographs are far more real than the well-dressed eyes wandering the room (Credit: Nancy Stanley). Perhaps it is because I had been playing with Ford’s camera earlier today that the photographs feel abnormally close. I can’t help but envision myself on the other end of the camera lens, looking through layers of carefully cut glass into Sharbat Gula’s eyes. Not all the pictures are so haunting. There are also those of festivals and smiles. There is much pride and strength in these people. They are vibrant. On a wall close to the entrance there hangs a picture of an adolescent boy and two or so other men, clothes wet with mud and the sweat of exertion, digging a tunnel underground. The boy holds his hands up to where light shines through a small opening in the otherwise dark passageway. The entirety of his being is arched, desperately, to the light. His hands are searching — I’m not sure what for. The photographs are masterful. I leave the exhibition room early. We’re back at the apartment now after a morning walk through the Jewish district. Exploring the Great Synagogue of Budapest today, I re-realised my ignorance of all things hugely important that don’t directly concern the minutiae of my everyday life: history and religion, for example. Despite her cynicism at the faith of her home country, Alo met my relentless questions on Judaism and Jewishness in general with balanced answers as we sat in a structure analogous to those things I would call “pews” in the churches of my childhood. Other people’s history makes me feel small but important; I know that, in some obscure and indirect way, their history is also mine. On our way back through the district, we stopped at a store that offered imported Israeli and Kosher merchandise for sale. Alo bought hummus, tahini, and a type of candy bar from her childhood in Israel that I might best describe to the uninitiated as the lovechild of a KitKat and a Mars bar. 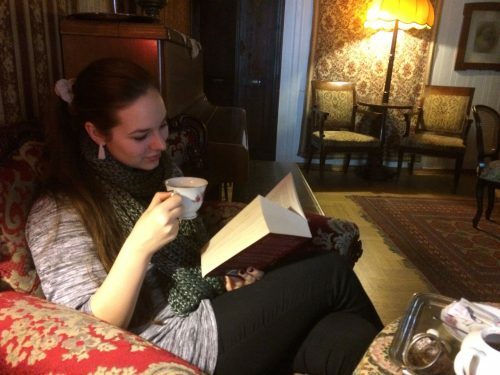 Acacia in a plush red armchair, immersed in an intimidatingly thick book. Today seems destined for exploring interiors (Credit: Nancy Stanley). It’s good to be out of the cold. It seems the cloud cover will not pass until morning. It has been decided that we will not go to Margaret Island today on account of the weather. Maybe tomorrow. We’ll see. The sun has returned and we’re off to Margaret Island! It has been patiently waiting for us since we postponed our visit yesterday: a 2.5km long , 500m wide publicly owned fairy-tale land of parks and ruins situated in the middle of the Danube. With the sun finally out after a full day in hiding, Alo and I decided to split from the group to do something lighthearted this morning. We stopped at a vintage flea-market while the others paid a visit to the House of Terror — a memorial to the fascist and communist dictatorial regimes of the 1900s. Navigating the flea-market proved to be the same kind of fun I had more than half a lifetime ago playing dress up with the few precious things in my grandmother’s closet. I can hardly even begin to describe the array of treasures we found there: genuine antique furniture, still functional cameras from the early 20th century, record players and pocket knives, paintings propped against pottery, lace doilies, cracked leather handbags in the dozens strung from ceilings, harmonicas beside half-broken kitchenware, to name but a few. Each shop held something new. Most of the merchandise was in pristine condition. After pleading my poverty to a seasoned shopkeeper, I managed to secure a small fortune of vintage postcards for the last of my Hungarian forints. 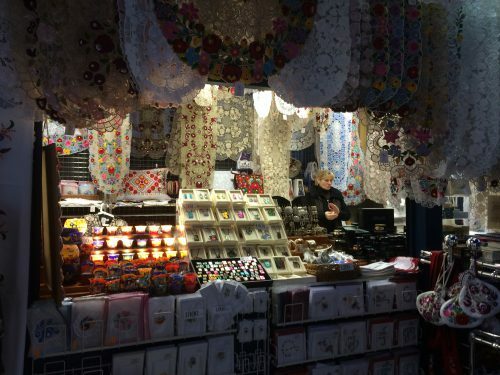 Traditional Hungarian lace and other merchandise is offered for sale atop Castle Hill (Credit: Nancy Stanley). But not all the wares were so innocuous. At a stall near the exit of the market, paraphernalia I had only ever seen in museums, movies, and history books were on display: an assortment of badges and pins embellished with Swastikas and the pan-communist hammer and sickle reclined in the creases of a velvet cushion. They were well cared for. Their vendor had them neatly displayed upon the luxurious, ruby-red fabric. Other relics of the past to be found on his tabletop included clothing patches and bullet casings. A faded star of David lay limply in a plastic sleeve beside a selection of devastatingly beautiful skull rings. History has never felt so real to me as it did then, in the cold bite of those silver rings at my fingertips. I closed my eyes to the baby-blue sky and imagined the naked circle of metal that now lay beneath my skin embracing a man’s finger; I imagined the pride with which it must have been worn. My breath caught on the thought of the power such symbols have over our lives. I was enchanted. How horrifyingly seductive was the cool metal’s touch. 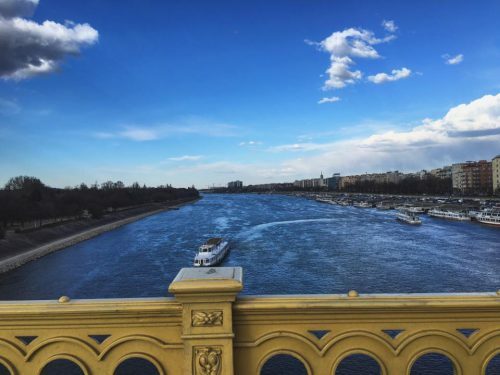 The sun gazes fondly over the Danube as a ferry passes us by (Credit: Tanya Sharma). Images of the week flicker past my mind’s eye like sequins in a gyroscope as we make our way from the Hostel Astoria where we left our luggage this morning to the central station. We walk quietly but determinedly, each step now directed home. Today has been one of the closest things to a story-book adventure I’ve ever had. It involved a short hike up Victory Hill for a panoramic view of the city and a close encounter with a gang of crooks that was systematically swindling innocent hill-top hikers. After Ford caught them on his camera, Zoltan anonymously tipped the cops off to their gambling operation and we discreetly retreated to the Rudas Bath House until dusk. I felt as if I was born again in the thermal waters … They are said to have healing powers. We make it to the station well ahead of departure time. We are back at the place where we first set foot in Budapest. I recall my first impressions and uncertain expectations of the city. It’s only been 5 days, but it feels like a lifetime ago since we arrived. We unanimously settle on a bench on which to pass the following hour. Luggage and backsides are deposited on the pavement while plans to remain there until further notice are made. Each is content to remain wrapped in the blanket of their own thoughts under the glaring artificial light. I know we’ll be sitting down for a good half day yet, so I decide to leave my backpack in the care of the others and follow the train tracks instead. The night air is cool and refreshing. The open-air train station strikes me as more authentic than Berlin’s own sleek Hauptbahnhof. It is less commercial but perfectly functional. Instead of an overwhelming variety of chain stores to choose between, a scattering of food-stalls is set up along the pavement, ready to meet the demands of the hungry passerby. The sights and sounds of the city — its people, parks, buildings; food, music, and history — are objectively just as exciting as what we might find anywhere else we visit. But it’s different here: It’s Hungarian. This difference is immediately obvious yet impossible to pinpoint. It’s in the way people call to each other on the streets and in how the cars stop to let presumptuous pedestrians cross. It’s in the squat and sturdy height of the buildings that line the sidewalks and the cheery facade of our homey apartment building reflected in the squeaky-clean windows of the four-star hotel directly opposite. “It’s just what I imagined Europe would look like,” Ford had said to me as we were window-gazing on the tram the first day here. I gestured abstractly to our surroundings. The window looked out upon a melee of buildings vying for space over wonky cobblestoned streets and a mixture of dark-haired, somewhat warmer-looking people than those one typically encounters in Berlin going about their usual business with the certainty of a routine — as if they hadn’t realised just how exciting everything is. I can’t describe it much differently. Our train pulls up. We reassemble our thoughts and gather together our luggage. Apu Zoltan has come to the station to see us off. He will remain in Budapest awhile longer before returning home. I step up from the platform onto the train, heaving an assortment of my worldly possessions up with me. My feet have left Budapest; already I know I want to return. The following image is included here in memory of Ford’s camera and laptop that were stolen the night of the train ride back to Berlin. What has become of the pictures contained within the camera’s memory remains a mystery.